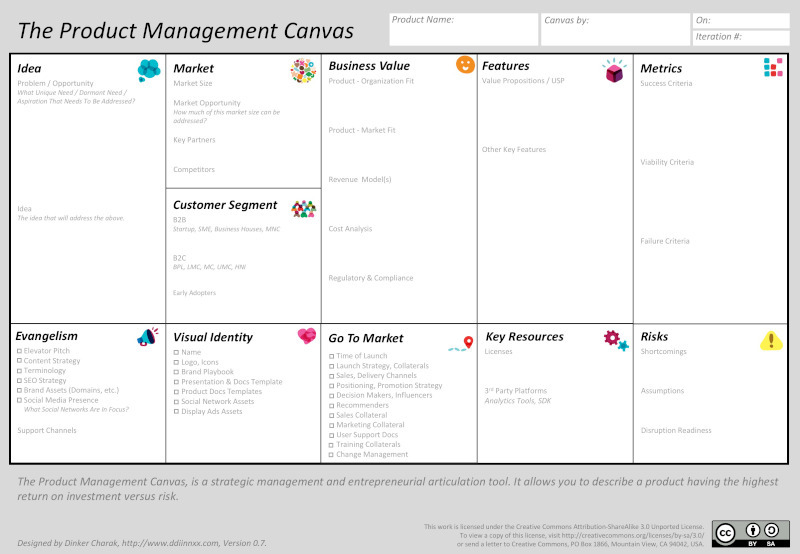 The Product Management Canvas (PMC), is a strategic management and entrepreneurial articulation tool. It allows one to describe a product having the highest return on investment versus risk. This is different from Product Model Canvas or Roman Pichler’s Product Canvas. Where Does Product Management Canvas Fit? Let us understand the Product Flow. I have talked about it earlier in the Hackathon: From Idea to a Product in a Day post. Using Elevator Pitch & Product in a Box, we describe the product we want to build. However, no product exists in a vacuum and is part of an ecosystem. We then layout the Product Ecosystem that enables the key product. The product is then described using the Product Management Canvas. A Product Management Canvas then informs the process of Epics. Adding a business case to these we arrive at a Product Backlog. Each item in the Product Backlog can lead to one or more stories. When these stories Go Live and the hit the market, in the spirit of build-measure-learn, we learn and periodically do the Product Backlog Grooming. The Elevator Pitch & Product In A Box, (Lean) Business Model Canvas, High-Level Products Layout and Product Management Canvas are explained in the blog post above. Epics, Product Backlog, Stories and Build-Measure-Learn are standard terms that are described as part of the Agile process. I think this sits one step before Roman Pichler’s Product Canvas and used to plan and describe a product, rather than track the agile product creation/development. The canvas started as a checklist for Product Managers to ensure they have not missed any aspect of Product planning. However, it was always aimed to capture the current state of an evolving product. Thus, Product Management Canvas should be used to communicate across various groups and departments to ensure all have the same picture of the product. We start with describing the original problem or opportunity that the product addresses. It can be a unique need, a dormant need (we are creating the market) or aspiration (of the user/customer) that needs to be addressed. Once the above is stated, it is important to connect it what the idea of the product and state how it addresses the above. Start by stating the market size (defined as the market volume or the market potential). VCs will want this to be a very big number. Big enough to accommodate you and all your competition. The state the market opportunity your product addresses from the whole market size. This should be a more realistic number that should allow you sufficient growth so as to allow you to give investors a good rate of return. A product never exists in a vacuum. There is an ecosystem of partners that enable it. We should note all key partners (data suppliers, data consumers, channels, SDKs and so on). What’s fun without any competition? It is important to note competition and track them. If you have analysed competition in detail, you can add the link to that document. My thoughts on how to do Competition Analysis. Identifying if the product is B2B or B2C is sometimes obvious. But going one level deeper is important. (does my B2B target Startup, SME, Business Houses, MNC, etc. or does my B2C target BPL, LMC, MC, UMC, HNI, etc.) is important. Does my B2B target Startup, SME, Business Houses, MNC, etc. or does my B2C target BPL (Below Poverty Line), LMC (Lower Middle Class), MC (Middle Class), UMC (Upper Middle Class), HNI (High Networth Individuals), etc.)? Also important is to identify Early Adopters, Influencers, Recommenders and Innovators who try something new. Large organisations that create a lot of products need to ensure that there is a product – organization fit. This would involve making sure that it fits in tot established ecosystems, reuses tools used, etc and does not create whole parallel infrastructure requirements. The product – market fit is very important and needs to be articulated crisply. There are many revenue models available and many times the same product will have multiples of them. State the considered revenue models in this section. Cost Analysis is a complex task but having a broad idea of the cost of producing the product that reflects the pricing model is recorded. Even when the aim is to invest in seeding the product, it is important to state and communicate the revenue – cost ratio. It is important to state the key Regulatory & Compliance items. These should not slip through cracks of day-to-day tasks. It is important to state the value propositions / USP and communicate it uniformly. Not every differentiation is a USP, nor should it be. Along with USP, the other key features that set us apart, make usage simple or make us better than competition should also be noted. We all talk about success metrics. But before a product is successful there are some metrics that are minimal a product should achieve. These should not be ‘not meeting success metrics’, but independent ones. Eg: while achieving an MAU of 1M is the success for your chat app, the number of messages exchanged is not growing at the same rate as user adoption is a failure metric. Failure metrics are important as they tell us how key hypotheses could be wrong and it is time to reassess them and re-learn and re-build. Viability metrics are good to have to make sure we are on track to success. Product evangelism is, as Guy Kawasaki put it years ago, “selling the dream.” It’s helping people to imagine the future, and inspiring them to help create that future. Many things need to fall into place for an Evangelist to be effective. This section offers a checklist of essential items need to enable an evangelist. This includes an elevator pitch, relevant content generation is a content strategy to keep it updated, uniform terminology across all departments and collaterals, SEO strategy so content is geared to show up in right searches, right brand assets, and social media presence. Using all possible social networks is not the right approach. Choose and state ones that are relevant to the product, the audience and manageable by the team. This section offers a checklist of essential items need to establish a visual identity. Product name, logo, icons, brand playbook, presentation/docs/stationery templates, product docs templates, Social Network assets (cover picture, etc.) and display ads assets. This section offers a checklist of essential items to formulate an effective go to market strategy. In the case of a new product, time of launch is an important date/period. Product Manager should initiate and collaborate in the launch strategy & related collaterals, describing sales and product delivery channels, positioning & promotion strategy, identify and help reach out to decision makers, influencers & recommenders, sales collateral, marketing collateral, user support docs and training collaterals. Often a product leads to changes in processes and people. The product manager has to think about a change management template. Stating key resources is important as it allows a product manager to track them. This includes licenses (eg: SSL licenses as anybody can forget to renew on time like this, this and this), 3rd party platforms like SDK, analytics tools, etc. State the known shortcomings and assumptions made. This helps plan the build-measure-learn better. Product managers need to be paranoid about the product getting disrupted. Disruption Readiness is important to consider by identifying processes and methods that can be all be replaced in one go.